"In light of the current political and social environment, it has been determined that any attempt to host a festival will not be successful," reads the email from the board of directors. "Please keep in mind that we are a not-for-profit organization run almost solely by volunteers." The festival was set to kick off June 7 with a Wine Up To Pride event at Dr. Wilbert McIntyre Park in Old Strathcona. The Pride parade was scheduled for June 8 on Whyte Avenue. "It has always been the goal of the Edmonton Pride Festival Society to host a safe and enjoyable event that is as reflective and encompassing of the entire community as possible; however, given current events, we do not feel that this is attainable for this year," the email from the society said. A screenshot of the email was shared widely on the Facebook page for a well-known LGBTQ bar in Edmonton, Evolution Wonderlounge. Co-owner Rob Browatzke said he posted it to the page after the email was forwarded to him. "We shared it on our social media to start a conversation about it, and that conversation certainly has happened," said Browatzke. "It was too important to not be sharing with the members of the community that the festival is for." Browatzke said he was disappointed, but not surprised. The board has faced mounting pressure in recent weeks to restructure the festival and the organization to feature the experience of black, Indigenous and people of colour in the LGBTQ community. "I'm certainly disappointed that this is the solution that's been reached for now. I'm hoping that, maybe, the email will be a call to action for members of the community to come out, make the necessary changes, have the necessary conversations to get Pride onboard." "There's absolutely still need for Pride. The need for Pride continues to change. And right now, maybe Pride needs to be raising up the voices of people that haven't always had that media spotlight on them," he said. He said Evolution Wonderlounge will still go forward with its own Pride Week events, and he expected other businesses and organizations will do the same. "Losing the parade is a blow. Losing that massive Pride in the Park party is certainly a blow. But Pride isn't cancelled." The board was meeting on April 4 to discuss a list of demands put forward by two local organizations — Shades of Colour and RaricaNow — that advocate for people of colour and refugees in Edmonton's LGBTQ community. The demands include a call for the festival to allocate more funding to under-represented artists and facilitators. The same groups also helped organize a demonstration at last year's Pride parade calling for the organizers to uninvite Edmonton police, RCMP and military personnel, amid a Canada-wide debate over the presence of police in Pride parades. Four representatives from the two groups were invited to speak at last week's meeting, according to Clayton Hitchcock, co-chair of the Pride Festival Society. But when roughly 30 supporters showed up, they were stopped at the door and told they had to be members of the organization to participate in the meeting. But they said it was "a moment of pure irony" when the board called the police on a peaceful group trying to discuss the history and relationship between police and Edmonton's LGBTQ community. Later that day, the festival announced on Facebook the meeting had been moved to a second location because of "safety concerns." The post was inundated with comments denouncing the decision to call police. 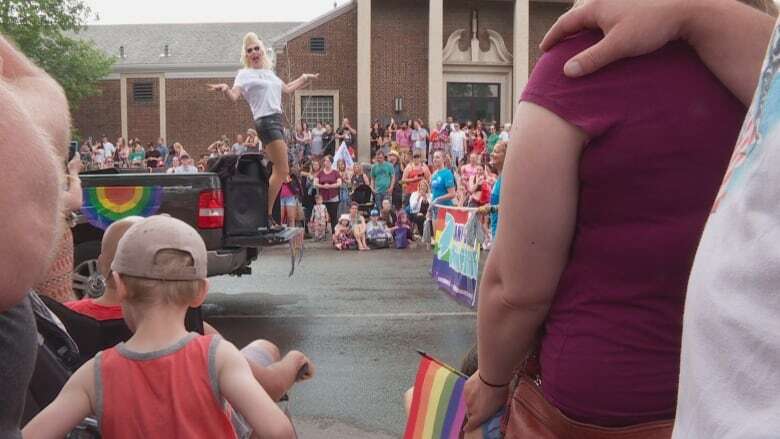 Shades of Colour's Facebook page was also flooded with negative comments in the wake of the decision to cancel the Pride Festival, Guzman said. "I was very shocked and taken aback by the notice that the Pride Festival decided to cancel. My immediate feeling that came after that was fear, fear for the negative backlash," they said. "Now I'm just very exhausted and sad." Guzman added that the group had been working with the festival's board for months to ensure the voices of LGBTQ people of colour were at the centre of this year's festival. "I understand where people are coming from, I really do. This hurts. This hurts everyone."